According to a new research report by Transparency Market Research (TMR), the global dental implants market is largely consolidated are witnesses a high degree of competition between the leading players. In 2015, the top three players, namely, Danaher Corp., Institut Straumann AG, and Dentsply Sirona, held 53% of the overall market. The research report states that the entry barriers for new players is low and the established participants are required to focus on the localized markets in emerging economies, such as India and China in the years to come. 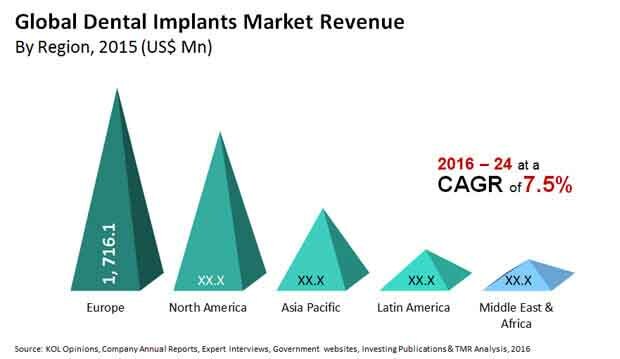 As per TMR’s estimations, the global market for dental implants, which stood at US$4.46 bn in 2016, is projected to expand at a CAGR of 7.90% during the period from 2016 to 2024 and touch an opportunity of US$8.18 bn by the end of the forecast period. Presently, the demand for titanium implants is higher than others and this scenario is likely to remain so over the next few years, reports the market study. The report has also presented a geographical assessment of the worldwide market for dental implants. The Middle East and Africa, Europe, Asia Pacific, Latin America, and North America have been considered as the prime geographical segments of this market in this research study. Among these, Europe emerged as the leading regional market for dental implants in 2015 with a contribution of US$1.71 bn. Researchers anticipate this regional market to remain dominant over the forecast period, owing to the presence of a large pool of key participants. Favorable policies and government support have allowed leading players to speed up their research and development efforts, which is likely to bear fruits for the Europe market for dental implants in the near future. Although North America has acquired the second position in this market, it is Asia Pacific, which is expected to surface as the most promising regional market for dental implants over the period of the forecast. Several Asian countries, such as China and India, are displaying significant rise in the demand for advanced medical facilities, fueled by the increase in the disposable income of consumers, which has enabled them to afford expensive treatments. Also, a significant upswing in aesthetic consciousness of people has been observed in this region, which is expected to create a high demand for dental implants in the years to come, reflecting positively on the Asia Pacific market for dental Implants. “The global market for dental implants have essentially been driven by the increasing occurrence of plaques and cavities in consumers’ teeth,” says a TMR analyst. People across the world have been increasingly opting for dental treatment over the last few years, most of them being elderly individuals. Though children have been the key contributor to this market so far, the ever-rising geriatric population is expected to add to the growth of this market in the next few years. On the other hand, the high cost associated with several types of dental implants and the lack of favorable insurance and reimbursement scenarios may create obstacles in the growth trajectory of this market in the years to come, states the report.